The management of deer impacts on forested lands requires quantification of the negative factors (e.g., bark stripping) on tree survival in relation to other ecological variables (e.g., competition from neighboring trees). 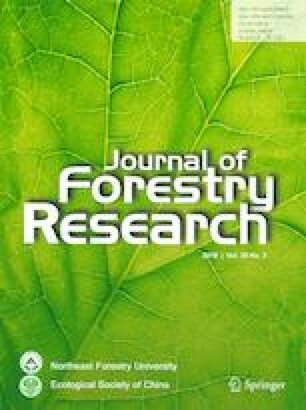 This study measured the effects of bark stripping by sika deer, Cervus nippon, and competition among trees on the survival of Abies veitchii in a subalpine coniferous forest in central Japan over 12 years. Most of the trees subjected to bark stripping by deer were small (< 10 cm in diameter at breast height); however, some trees were stripped repeatedly. Although light bark stripping did not strongly influence tree survival after 12 years, heavily stripped stems (i.e., > 65% of the stem circumference stripped) were severely affected. The effect on longevity for each tree after bark stripping was explained by maximum bark stripping intensity during the study period, rather than initial bark stripping intensity. When > 85% of the stem circumference had been stripped, survival rates decreased. Bark stripping influenced survival rates much more than competition from neighboring trees. Because bark stripping occurred repeatedly, frequent measurements are important to grasp the full effects caused by this action. Heavy bark stripping of a stem enhances tree mortality. Thus, management of bark stripping is an essential element of stand maintenance and species composition in subalpine coniferous forests in Japan. Project funding: This work was funded by a JSPS KAKENHI Grant (16K07801). I thank Fumiko Arakawa, Kazuaki Takahashi, Yoichiro Takanose, Nobumasa Arai, Midori Abe, Mio Hamanaka, Kururu Yoneyama, and Rieko Yamanaka for data collection.